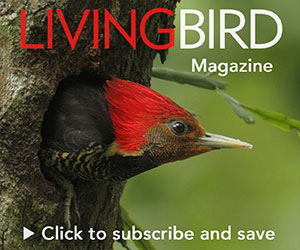 Published in the Summer 2015 issue of Living Bird magazine. Tail-feather shape and the sounds the feathers produce during courtship played major roles in distinguishing the Inaguan Lyretail (right) as a separate species from the Bahama Woodstar (left). Photos by Anand Varma. These days, the discovery of a species usually requires treacherous treks into remote jungles untouched by science. But the world’s newest bird species was discovered, not in some remote tropical jungle, but in backyards in the Bahamas. A member of the Bee Hummingbird group, the Bahama Woodstar includes two subspecies which scientists now say should be recognized as two distinct species. “Much of fieldwork was conducted sitting at the backyard tables of birders, holding the recorder in one hand and a cup of tea in the other,” explained Teresa Feo, a doctoral student at Yale University and lead author of the study, published in the January issue of The Auk. The Bahama Woodstar species contains two subspecies, Calliphlox evelynae evelynae found throughout the northern islands of the Bahamas, and Calliphlox evelynae lyrura found only among the southern Inaguan islands of the chain. Both males and females of the two are strikingly similar, but in this case appearances were deceiving. The females of the Bahama Woodstar (above) and Inaguan Lyretail are nearly identical, but differences in song, behavior, physical measurements, and DNA recently led researchers to conclude these are two distinct species. Photo by Matt MacGillivray via Birdshare. Physically, males in the two subspecies differ only in their forehead colors and forked tail feathers. These minor differences helped naturalists originally describe the birds as different species in the 1800s. Yet James Peters ignored that precedent when he published the Check-list of Birds of the World in 1949 and lumped the species together as the Bahama Woodstar. Sixty years later in 2009, Feo teamed up with ornithologist Christopher Clark from the University of California, Riverside, to study the bioacoustics of the Bahama Woodstar, specifically to record the pops and whistles produced when air runs along male tail feathers during mating display dives. Feo and Clark found that small differences in the tail feathers between the two subspecies resulted in distinct visual and acoustic courtship signals so that males would attract only females of their own kind. Researchers could also distinguish between the birds just by their vocalizations. Males from the more widespread subspecies in the northern islands produced the classic hummingbird “light tinkling, rambling songs,” described Feo, while males from the southern islands sounded more like “wet squeaky shoes.” The birds also sang different calls and scolding sounds, indicating a long history of geographic separation. Because hummingbirds learn their songs from parents and neighbors, species separated by distance can develop unique dialects, much like humans. In this case, separation between the northern and southern islands of the Bahamas was enough for the subspecies to create different languages. The team also compared beak and wing lengths, and collected tissue samples from the two populations for genetic analyses. Doctoral students Jacob Berv from the Cornell Lab of Ornithology and Jacob Musser from Yale worked together to sequence the birds’ DNA and found many species-level differences that indicated the populations have evolved in isolation for about half a million years. Jacob Musser, Christopher Clark, Teresa Feo and Jen Marks Clark (left to right) observed and recorded the courtship displays of male Bahama Woodstars conveniently in the backyard of local birders. Photo by Jen Marks Clark. Feo, Clark, Berv, and Musser conclude that the northern islands subspecies should keep the familiar name, ‘Bahama Woodstar’, and they suggest ‘Inaguan Lyretail’ for the other subspecies because it is found only among the southern Inaguan Islands of the Bahamas and because its forked tail shape resembles a classical lyre harp. The team will soon petition the American Ornithologists’ Union to officially recognize the species split. But exactly how the birds should be reclassified offers new dilemmas. “All of bee hummingbird taxonomy is in a major flux at the moment,” explains Feo.